Average insurance rates for a 2001 Ford F-150 are $910 a year for full coverage. Comprehensive insurance costs on average $150, collision costs $150, and liability coverage costs around $452. Buying a liability-only policy costs as low as $504 a year, with high-risk insurance costing $1,936 or more. Teen drivers receive the highest rates at $3,694 a year or more. Rate data is compiled from all 50 U.S. states and averaged for all 2001 Ford F-150 models. Rates are based on a 40-year-old male driver, $500 comprehensive and collision deductibles, and a clean driving record. Remaining premium consists of UM/UIM coverage, Medical/PIP, and policy fees. For a middle-aged driver, prices range go from as low as $504 for just liability coverage to the much higher price of $1,936 for a high risk driver. These differences show why everyone should compare prices based on a specific location and risk profile, rather than using price averages. Looking for better car insurance rates for your Ford F-150? Scraping up a payment for overpriced Ford F-150 insurance can empty your bank account, especially in this economy. Comparing price quotes is free, only takes a few minutes, and is a good way to tighten up your finances. Because you have many car insurance companies to choose from, it is hard for the average consumer to locate the best insurance company. Companies that sell car insurance don’t list all available discounts very well, so the following is a list of both the well known and the harder-to-find ways to save on car insurance. Multi-policy Discount – When you combine your home and auto insurance with the same company you could get a discount of approximately 10% to 15%. Discount for Life Insurance – Companies who offer life insurance give a discount if you purchase auto and life insurance together. Resident Student – Youth drivers living away from home attending college without a vehicle on campus can be insured at a reduced rate. Sign Early and Save – Select companies give a discount for switching to them prior to your current policy expiration. It can save you around 10%. Braking Control Discount – Vehicles with anti-lock braking systems are safer to drive and will save you 10% or more. Own a Home – Owning a home can help you save on car insurance because owning a home demonstrates responsibility. As a disclaimer on discounts, some credits don’t apply to the entire policy premium. Most only apply to individual premiums such as medical payments or collision. Just because you may think you would end up receiving a 100% discount, it just doesn’t work that way. Check with each company which discounts you may be entitled to. Savings might not be offered in your area. When buying coverage for your vehicles, there really is no “perfect” insurance plan. Everyone’s situation is unique and a cookie cutter policy won’t apply. These are some specific questions may help you determine if your situation will benefit from professional help. Do I have newly-aquired coverage? Insurance providers like Progressive, Allstate and GEICO consistently run ads on TV and radio. They all have a common claim that you’ll save big if you change your policy. But how can every company claim to save you money? Insurance companies can use profiling for the right customer that makes them money. For instance, a driver they prefer might be profiled as a mature driver, is a homeowner, and drives less than 7,500 miles a year. A customer getting a price quote that hits that “sweet spot” will get the preferred rates and most likely will save quite a bit of money when switching. Potential customers who fall outside the “perfect” profile will be quoted higher prices which usually ends up with business not being written. Company advertisements say “customers who switch” not “everybody who quotes” save that much money. This is how insurance companies can confidently make the claims of big savings. This emphasizes why drivers should get a wide range of price quotes. It is impossible to predict which insurance company will have the lowest Ford F-150 insurance rates. Learning about specific coverages of a car insurance policy can help you determine the right coverages and the correct deductibles and limits. The coverage terms in a policy can be difficult to understand and nobody wants to actually read their policy. These are the usual coverages offered by car insurance companies. This coverage protects you from damages or injuries you inflict on other people or property by causing an accident. This coverage protects you against other people’s claims. It does not cover damage sustained by your vehicle in an accident. Split limit liability has three limits of coverage: per person bodily injury, per accident bodily injury, and a property damage limit. You might see values of 25/50/25 that means you have $25,000 bodily injury coverage, $50,000 for the entire accident, and $25,000 of coverage for damaged property. Liability coverage pays for things such as court costs, loss of income, pain and suffering and medical expenses. How much liability should you purchase? That is up to you, but buy as much as you can afford. This coverage will pay to fix damage to your F-150 caused by collision with another vehicle or an object, but not an animal. You will need to pay your deductible then the remaining damage will be paid by your insurance company. Collision coverage protects against claims like backing into a parked car, crashing into a ditch, rolling your car and driving through your garage door. Paying for collision coverage can be pricey, so consider removing coverage from lower value vehicles. 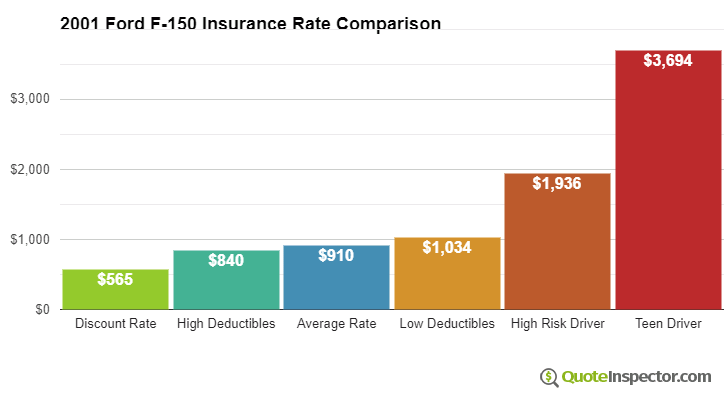 Drivers also have the option to bump up the deductible to save money on collision insurance. This coverage covers damage from a wide range of events other than collision. You first have to pay a deductible then your comprehensive coverage will pay. Comprehensive can pay for claims like hitting a bird, falling objects, damage from flooding, hail damage and theft. The maximum payout a car insurance company will pay at claim time is the market value of your vehicle, so if the vehicle’s value is low consider removing comprehensive coverage. This coverage gives you protection when the “other guys” either have no liability insurance or not enough. This coverage pays for hospital bills for your injuries and also any damage incurred to your 2001 Ford F-150. Due to the fact that many drivers only purchase the least amount of liability that is required, their limits can quickly be used up. This is the reason having UM/UIM coverage should not be overlooked. As you restructure your insurance plan, make sure you don’t sacrifice coverage to reduce premiums. In many instances, someone sacrificed collision coverage and found out when filing a claim that saving that couple of dollars actually costed them tens of thousands. The aim is to find the BEST coverage at an affordable rate. Low-cost 2001 Ford F-150 insurance can be found both online as well as from independent agents, so you should be comparing quotes from both to have the best chance of lowering rates. Some companies don’t offer online quoting and these small, regional companies work with independent agents.